After reading the blurb, I immediately wanted to know more. I invited the author aboard and she kindly allowed me to pick her brain about her story. Enjoy! The Galaxy Express: Tell us a bit about yourself. When did you know you wanted to become a fiction writer? Lise MacTague: I’ve been writing ever since I could remember, but I stopped when I was in art school and it took me a long time to come back to it. For a while, I was writing professionally, but essays and articles weren’t really helping me scratch the creation-itch I’ve always had. A number of years ago, I experienced a long bout of insomnia. Coming up with plots to stories helped me deal with it. I had something to work on when I couldn’t sleep so I didn’t feel like I was wasting my time, but it was something that I could let go when I finally got tired enough to fall asleep. After a while, I realized that I kept coming back to the same story over and over again, so I started concentrating on it and fleshing it out. After about two years of that, I discovered that I had something pretty fully-fleshed out. Not only did I have a pretty detailed plot, but I had my main characters established, and the setting. I’d put enough work into it, and I didn’t want to lose it, so I started writing it up. 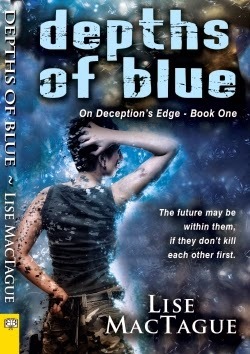 Originally, the whole On Deception’s Edge trilogy was supposed to be one book. As I started writing, I quickly realized that it was going to be pretty long for just one book, so I divided it up into three books and adjusted some of the plot and pacing to reflect that. It’s probably a good thing, because I wrote all three books before looking for a publisher, which means that the sequels to Depths of Blue will be available pretty quickly. TGE: What was the inspiration for your On Deception's Edge trilogy? LT: What inspired me to write the trilogy was the opportunity to explore the question of what happens to a person when they’re forced to hide a major part of who they are for most of their life, and the only person who knows their real identity is taken away. The trilogy follows Jak Stowell who has been living as a man and who has been completely alone and isolated for years. This is the story of her journey to rediscover her identity. Along the way, she also discovers love, but can she truly love another when she doesn’t know who she is herself? Questions of gender identity have long interested me, and I see a lot of coverage relating to the trans community, which is something I personally relate to. In a way, this is the opposite of many experiences that trans men and women have when claiming their true identities. In this case, Jak is a woman (a gender non-conforming one to be sure), and she needs to discover and claim what it means to her to be female. Finally, while working on a project at my day job, I spent a lot of time immersed in World War I research. I drew on that to describe the main military conflict in Depths of Blue and to a lesser degree A Vortex of Crimson (book 3 in the series). I took the idea of trench warfare and added a bit of a twist in the form of a miles-long forcefield that divides two continents, and the two sides from each other. The trenches and the forcefield have forced a grinding stalemate between the Devonites and the Orthodoxans in their interminable civil war, and this is the situation into which I drop the other main character: Torrin Ivanov. She’s pretty much a fish out of water. More accurately, she’s a fish in a kettle of very hot water that is getting hotter by the second. TGE: What’s the setting like? LT: I like to refer to the setting as “not-as-dystopian-as-those-guys-over-there.” The action takes place on a planet with a society that is misogynistic and treats women as lesser creatures. The only thing that keeps their society from being a complete and utter dystopia is the fact that the other main group on the planet treats women solely as breeding stock. The two groups have been grinding their way through a civil war for decades, and that conflict shows no sign of ending. The ugliness of the two societies is in direct contrast to the loveliness of their planet. Haefen is filled with beautiful scenery. Much of it is temperate rain forest, like that of the Pacific Northwest. It is the majesty of towering trees and craggy vistas, overlaid with shades of blue, that acts as a jarring foil for the two cultures locked in a thirty-year religious war. TGE: On a scale of 1-10, how would you rate the action-adventure quotient in DEPTHS OF BLUE? LT: On a scale of 1-10, I would rate this Depths of Blue a 9 on the action-adventure scale. (That’s only because I don’t believe in absolutes.) The book is pretty much non-stop action. There is just enough introduction to establish the setting, then we get right into the swing of things. The characters must make a perilous journey across hostile territory with only each other to count on, and neither one is sure if they can trust the other. Even when they get to friendly territory, they still can’t let their guards down before having to set out on yet another journey, this one with little to no time for preparation. They have to fight the land, strange creatures, all while avoiding enemy soldiers. On top of that, they fight the deepening attraction each woman has for the other. TGE: What’s the publication schedule for the other books in On Deception’s Edge? LT: The other books are coming out every 7-8 months. Heights of Green is scheduled to come out in November of this year, and A Vortex of Crimson should be out in late spring/early summer. The blurb and information for HoG is already available on Bella Books’ website. Hopefully, the cover art will also be available soon! TGE: Name a gadget you can’t live without. LT: I can’t live without my iPhone/iPad. I have so much going on these days that if something isn’t in the calendar app, it doesn’t exist for me. I’d love to be less tethered to the devices, but I’m resigned to it for the time being. TGE: What appeals to you about a strong, compelling female protagonist? LT: I believe in a world where strong female protagonists are nothing to be remarked at, they simply are. I hope that world gets here sooner rather than later. I love strong female characters. I think they’re a far more accurate reflection of reality than milquetoast wallflowers. Most of the women I know are badass and strong as hell, and I believe they should be able to see themselves reflected in what they read. TGE: Can you recommend a title or two similar to DEPTHS OF BLUE? 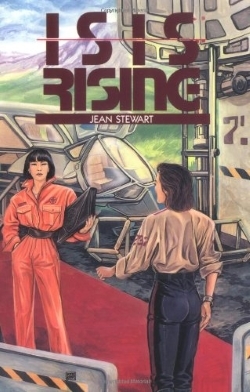 LT: A series of books that I love is the Isis Series by Jean Stewart. It’s chockablock with strong female characters, and also has a utopia/dystopia dynamic going for it. It starts with Isis Rising, and I can’t recommend it enough. Another series starts with Katherin V. Forrest’s classic Daughters of a Coral Dawn. It is pretty much the original lesbian utopia novel. The entire series is great, and each book is better than the last. It’s a rather different than the previous two titles, but I also recommend the Firefly TV series. It doesn’t have much of a romantic component, but the cross of scifi with wild west is something I was striving for with my series. TGE: It was great learning about you and your books! If readers want to know more, where can they find you? LT: Readers can follow up with me by checking out my blog: lisemactague.com, or by following me on FaceBook. I’m also active on GoodReads. Otherwise, anyone with questions or comments can always drop me a line at lise.mactague[at]gmail[dot]com. Ms. MacTague, thanks for your time, and for your art. For more geeky DEPTHS OF BLUE fun, check out the illustrated Map of Haefen the author created!